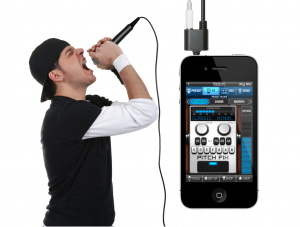 March 2011, Modena, Italy – IK Multimedia is proud to announce that VocaLive™, the first professional performing and recording vocal processor app for the iPhone®, iPod touch® and iPad®, is now available for download from the iTunes App Store. VocaLive provides vocalists with a suite of 12 real-time professional vocal effects along with a capable recorder for studio quality sound in a portable package. When used with the newly announced iRig Mic, VocaLive gives singers an easy-to-use but extremely powerful music creation tool that provides professional results previously achievable only with expensive hardware or complex computer software. VocaLive includes 5 Vocal Effects – Pitch Fix (for tuning correction or stylized quantization FX), Choir (a 3-part harmonizer), Morph (an X-Y pitch and formant shifter that changes the tonal quality of the voice from subtle deepening to radical gender bending), De-Esser and Double (Double effect gets unlocked by registering) – along with 7 Studio Effects – Reverb, Delay, Parametric EQ, Compressor, Chorus, Phazer and Envelope Filter – that together create the perfect vocal processing solution. The effects can be combined into a chain of three processors and saved as presets. A collection of dozens of Presets is also included to get you up and running immediately. VocaLive gives you the ability to record vocals or other instruments (single or multi-track) with effects, sing along with your favorite songs from your iTunes library (with a Voice Cancel feature for practicing over songs with existing vocals) and warm up your voice with the included Vocal Tools. VocaLive is an incredible professional vocal effects workstation that you can take with you anywhere. For the best quality, use VocaLive on stage or in the studio with IK’s new iRig Mic. You can also have fun with it or record quick ideas using the built-in iPhone mic, or you can use VocaLive with earbuds that have a built-in mic. With its 12 professional effects, Recorder and Vocal Tools, VocaLive is the most powerful vocal processing tool available on the iPhone, iPod touch and iPad! VocaLive is now available from the iTunes App Store at 19.99 / €15.99. iRig Mic, the quality condenser microphone for iPhone/iPod touch/iPad to be used with VocaLive, costs $59.99/€49.99 (excluding taxes). This entry was posted in iPhone App, iPhone News.